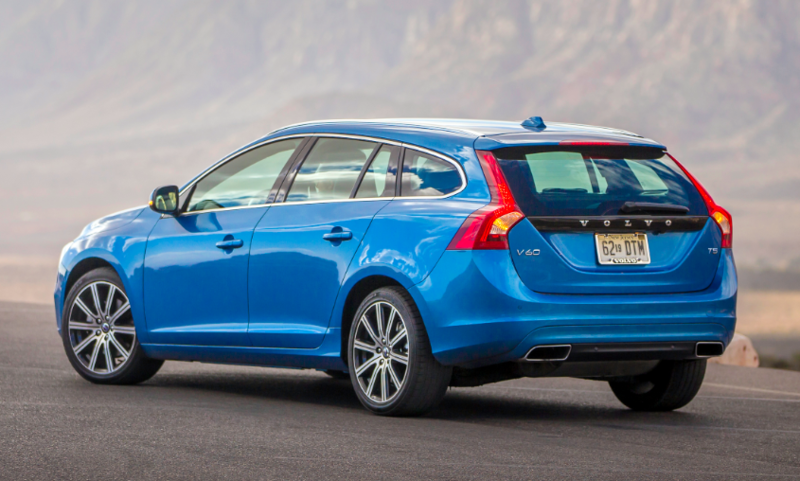 Based on the S60 sedan, the new V60 wagon is just going on sale now as an early 2015 model. Another, perhaps less-intended trait Volvo became known for was that of functional but staid styling. That, too, has been thrown out the window of late, with current models boasting the same swoopy lines that adorn their competitors. And this is the path the company continues to pursue: that of being all things to all premium-brand buyers. Today, Volvo offers a lineup that largely mimics those of its European competitors: midsize and larger cars and SUVs available with powerful engines and all-wheel drive. While the “cars” offerings of its closest rivals also include some station wagons, Volvo perhaps has had the most success with them. And the company is now trying to build on that success with another wagon model. Furthermore, it’s being joined by some new powertrains that Volvo says represent the direction the company will be heading in the future. Volvo’s mainstream midsize S60 sedan received a freshened front end for 2014 (shown) that will carry on to 2015 models, including its new V60 station-wagon sibling. Currently, Volvos are powered by turbocharged five- and six-cylinder engines carrying the (very logical) T5 and T6 designations, respectively. However, both are going to eventually be replaced by a pair of new four-cylinder engines that will be introduced over the next six months, and for a while, at least, will be offered concurrently. These new four-cylinder engines are part of Volvo’s Drive-E powertrains, which also include a new 8-speed automatic. Actually, the two new engines are the same engine with different induction systems. Both are 2.0-liter fours with direct injection, variable valve timing, and a stop/start function. However, one is turbocharged, the other turbocharged and supercharged, the latter offering more power. While one might logically assume these would be called the T4 and TS4, that’s not the case. Instead, Volvo is carrying over the T5 and T6 designations to the pair, presumably to maintain a lineage to current products. But it sure does cause some confusion, particularly since there will be two completely different engines using the same designation, at least for a while. But for now, the formula is that front-drive vehicles will get the new four-cylinder engines, while all-wheel-drive versions will get the old five- and six-cylinder engines. 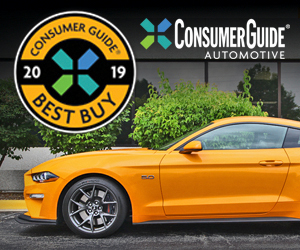 What we drove on a recent preview were a 2014 front-drive S60 sedan with the higher-power, 302-horsepower T6 four-cylinder, and a new-for-2015 front-drive V60 station-wagon variant of the S60 with the lower-power, 240-horse T5 four-cylinder. 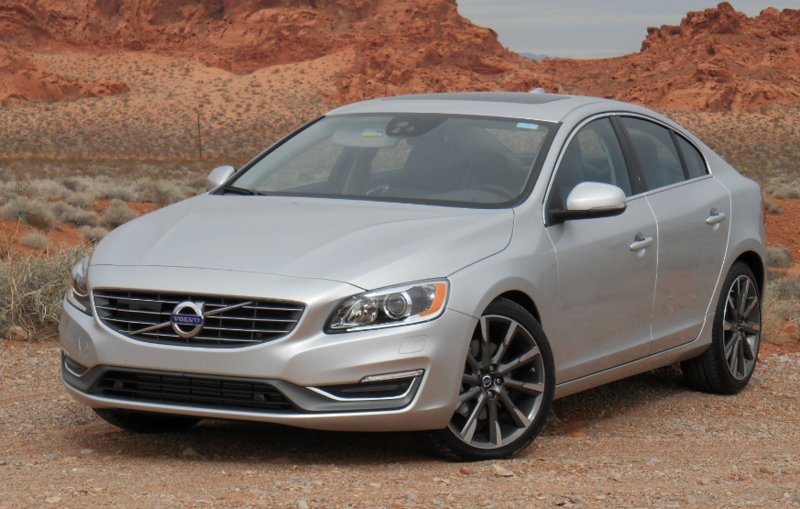 For 2014, the S60 sedan received a front-end freshening that was carried over to the 2015 V60 wagon. In fact, about the only place the sedan and wagon differ is aft of the rear seat, where the sedan’s 12.0 cubic-foot trunk is replaced by the wagon’s 43 cubic-foot cargo area. Aside from cubic cargo capacity, another difference between the sedan and wagon is that the sedan’s trunk floor is lower and has no cargo space underneath, and the folded rear seat backs rest about 5 inches above the level of the trunk floor. Though that height difference is bridged by an angled ramp, it would be difficult to slide heavier items all the way forward. By contrast, the wagon’s floor is higher, level with the hatch opening and the folded rear seat backs, and there’s quite a bit of under-floor storage. In most other respects, the two body styles are about the same. Inside, the S60 and V60 offer decent room for four average size adults. The front seats go down and back far enough to afford tall folks plenty of head and leg room, but you won’t fit anyone but a munchkin behind them. Unusual nowadays are available built-in child safety seats. Visibility is fine to the front corners, but thick roof pillars block the over-the-shoulder view. Helping visibility to the rear corners are rear-seat headrests that can be power-folded from the driver seat. Overall interior storage is just average. 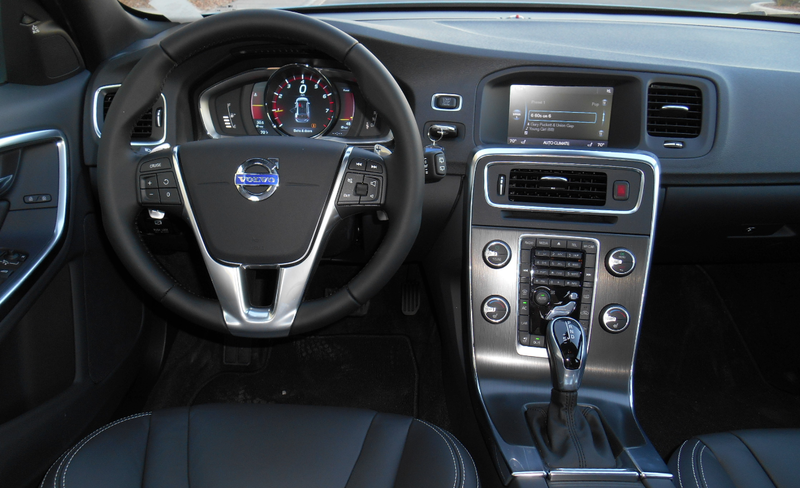 Both the S60 and V60 feature a revised instrument panel with a central pod that can be configured to display a variety of information. Retained are the numerous buttons used to control the audio and climate systems, a refreshing “retro” touch in an age of confusing touch screens and joysticks. Where the cars stand out is in their audio and climate controls. While most other makes – particularly in the premium classes – have gone to touchscreens and joysticks, Volvo retains conventional buttons … lots of them. We find this an advantage, and though it would be nice if they were larger and mounted higher, they’re certainly simple to use and within easy reach. On the road, both the S60 T6 and V60 T5 felt about the same in terms of ride and handling: nimble enough, but a bit too stiff over bumps for our tastes. However, both were fitted with optional 19-inch low-profile tires, which probably hurt the ride more than they helped the handling. It is in acceleration that the two understandably differ, but not by that much. Both are fine in normal driving, and the new 8-speed transmission mated to the engines kicks down quickly at city speeds, a bit less so at highway speeds. But when given the boot from a stop, it takes a moment for the T5 to gather itself before moving away with any authority, and acceleration after that isn’t completely linear. Under the same circumstances, the T6 moves away more smartly but is even less linear while building speed, and exhibits some rather strong torque steer whether turning or going straight ahead. The T6 in particular would likely benefit from all-wheel drive, but those models will – for the time being at least – be using the “old” turbo five- and six-cylinder engines. Also, the four-cylinder engines aren’t as smooth or quiet as the old five- and six-cylinder engines – or competing V6s. Furthermore, the stop/start function causes a bit of vibration and noise during transitions, but not enough to be annoying. From a stop, a quick foot can move from the brake to the gas and “beat” the auto start-up, but one really has to be trying. 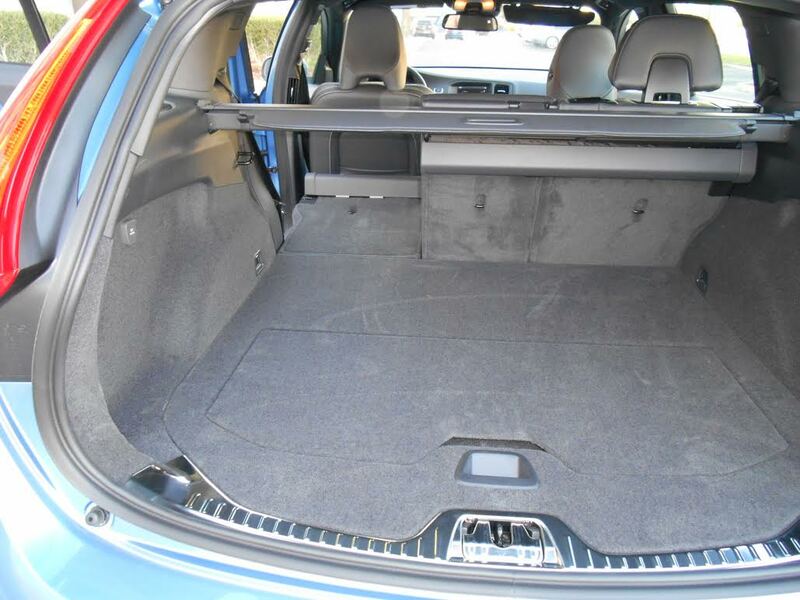 With rear seat backs folded, the V60 wagon boasts a long, flat cargo floor. There’s also a flip-up divider that sections off the rearward portion, along with a sizable amount of under-floor storage. Where the new engines shine is in fuel economy. The T5 is EPA-rated at 25 city/37 highway, which is not only impressive for a car of this size and power, but is up about 20% over the old five-cylinder T5. Equally impressive is the T6’s 24/35 rating. Premium fuel is recommended for both, but a company spokesperson said the engines wouldn’t be harmed if regular were used. Although performance and luxury remain among Volvo’s strengths, the company still hangs its hat on safety. That’s reflected in some new features available on Drive-E models, including Lane Keeping Aid (which can nudge the steering wheel to keep the driver in the lane) and the addition of cyclist detection to the Optional Pedestrian Detection system. Also offered are BLIS blind-spot alert, cross-traffic alert, and road sign information, which relays the speed limit on a given stretch of road. Also newly available on Drive-E cars is Park Assist Pilot to aid in parallel parking. Volvo has long been seen as a leader in safety, but the addition of the new Drive-E powertrains gives the company’s wares among the strongest performance-to-economy ratios in their class as well. Add in the sporty yet functional new V60 wagon, and Volvo’s midsize vehicles become viable contenders in an increasingly popular and competitive segment. Written by: Rick Cotta on February 10, 2014.on February 25, 2019.